All along the Pacific coast of North America, the sea stars have been disappearing. Commonly known as starfish, millions have died over the past year in an unprecedented outbreak of sea star wasting syndrome, a mysterious disease that causes sea stars to disintegrate as their arms fall off and tissues turn to mush. Now, scientists have found a potential culprit, a previously unidentified virus that is prevalent in symptomatic sea stars. In a paper published November 17 in the Proceedings of the National Academy of Sciences, researchers at Cornell University, UC Santa Cruz, and other institutions reported evidence linking the disease to a densovirus, a type of parvovirus commonly found in invertebrates. 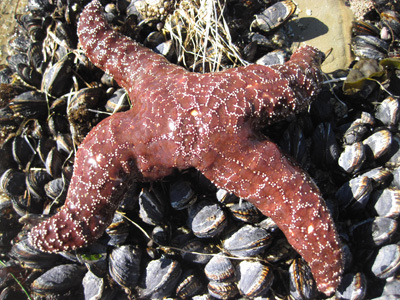 The paper includes a genomic analysis of the newly discovered "sea star associated densovirus" (SSaDV). According to coauthor Peter Raimondi, professor and chair of ecology and evolutionary biology at UC Santa Cruz, one of the key findings is the detection of the virus in museum specimens of sea stars collected as long ago as 1942. "The fact that it has occurred historically indicates that while this virus may be the agent that causes the disease, something may have happened recently that caused it to go rogue, because we've never seen anything like the current outbreak," Raimondi said. Initially, researchers suspected that warm water played a role in triggering outbreaks, but that now seems unlikely to be the cause across the range of locations that have been affected, he said. Raimondi leads the Pacific Rocky Intertidal Monitoring Program, which has been documenting the spread of the disease along the west coast and assessing its ecological consequences. Sea stars are voracious predators, and their disappearance could have dramatic long-term effects on marine ecosystems along the west coast. While Raimondi's group has focused on field studies, Cornell University microbiologist Ian Hewson led the effort to find the cause of the disease and is first author of the paper. "There are 10 million viruses in a drop of seawater, so discovering the virus associated with a marine disease can be like looking for a needle in a haystack," Hewson said. The discovery of the sea star associated densovirus is an important step in the investigation of sea star wasting syndrome, but many questions remain unanswered. In particular, no one knows how long the disease outbreak will continue or whether sea star populations will be able to recover. "Right now we are seeing renewed outbreaks in areas of the Olympic Coast, where it hadn't been very bad before, but now it's hitting with a vengeance," Raimondi said. Hewson's team detected the virus in samples of sea water and sediments collected from affected areas, as well as in sea urchins and brittle stars, which are closely related to sea stars but have not been affected by the disease. These findings raise concerns about the virus's ability to persist for a long time in affected areas. "If sea urchins are a nonsymptomatic reservoir for the virus, this might be a prolonged outbreak unless sea stars are able to develop immunity," said Raimondi, whose team is continuing to monitor the disease and study its effects on sea star populations and their ecological communities. "One thing that gives us some hope is that there are still places where they seem to be unaffected," he said. 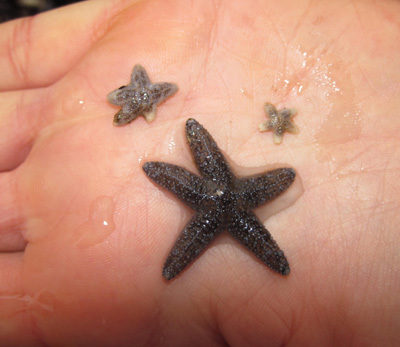 Another bit of good news is that huge numbers of baby sea stars have appeared in some of the sites the researchers are monitoring. In surveys conducted earlier this year, several sites in the Monterey Bay region had numbers of juvenile sea stars higher than had ever been recorded in 15 years of monitoring. "We'll just have to wait and see how well they survive," Raimondi said. Other contributors to the paper from UC Santa Cruz include Marm Kilpatrick, associate professor of ecology and evolutionary biology, and Melissa Miner, a research specialist at Long Marine Laboratory. The study team also includes researchers from UC Davis, Western Washington University, Wildlife Conservation Society, California Science Center, Los Angeles County Museum of Natural History, Monterey Bay Aquarium, National Parks Service, University of South Florida, U.S. Geological Survey, Seattle Aquarium, University of Washington, University of Connecticut, and Vancouver Aquarium.